IPEX 2017’s bold vision for an inclusive, visionary content programme launches today with the announcement of its Print In Action conference schedule and the first of its trio of exciting keynote speakers – Francois Martin. IPEX 2017’s bold vision for an inclusive, visionary content programme launches today with the announcement of its Print In Action conference schedule and the first of its trio of exciting keynote speakers. Francois Martin is the former global marketing head for HP’s Graphic Solutions Business and is now a senior graphics industry consultant and digital print evangelist. Having spent 12 years in customer-facing roles identifying opportunities for digital transformation, Francois’s keynote session at 14:00 on 31st October will address the industry’s technology roadmap, focusing on the evolution from ‘product and service’ company strategy to networks and platforms. He will explore new business models and propose a clear roadmap for both print service providers and the market as a whole. The conference schedule is full of experts from the length and breadth of the industry and beyond, promising inspiring, informative content for everyone that interacts with print in any capacity. Each day’s programme will be punctuated by three performances resulting from IPEX’s pioneering collaboration with the London College of Fashion (part of the University of the Arts, London) and panel discussions about its origins, results and findings. IPEX’s sessions have been designed by Matthews-Paul and Rogue Agency to be original and informative but also create dialogue. The Print In Action conference programme will run on the Centre Stage and is co-presented by Karis Copp, respected industry journalist and former online editor of SignLink and Print Monthly magazines. The eleven sessions all follow the style ‘Print In…’, reflecting the embedded nature of the print process and its intrinsic importance to the indicated areas. During each session three speakers will present on a topic acknowledging their expertise, before joining a panel to share and develop opinions, delving into the opportunities and challenges facing printers and their customers. On day one, Print in Style will explore the role that print plays in the increasingly fast-paced world of fashion and textile, while Print in Public shines a light on the types of print that members of the general public are likely to encounter, such as direct mail and display graphics. Print in Industry will provide an understanding of industrial print and its impact on manufacturing in general, with IMI Europe CEO Tim Phillips signed up to provide his expertise. Every printed product begins with some form of artwork, so Print in Design – which will feature Tony Harmer, Senior Solutions Consultant at Adobe – is set to disambiguate the knowledge gap between print and design. Print in Brand will discuss the way that businesses of all sizes, from start-ups to multi-nationals, are using printed materials to engage more effectively with their customers. As part of this session, Laura Jones, Senior Account Manager at Xcalibre Communications, will explain the dos and don’ts of a relationship with a print buyer. Closing off day two is Print in Publishing, covering best and worst practice, the ‘Kindle Effect’ and publishing’s role in a multi-channel world. The third day of IPEX 2017 will kick off with Print in Practice looking at practical elements of print, such as paper and substrates, the increasing importance of data and the value of finishing processes. Print in Retail sets its sights on print’s role in-store, including how retailers are combining wide-format print with messaging using digital screens; pro-AV expert and technology entrepreneur Bryan Crotaz, CEO of Silver Curve, will present on the opportunities for printers in this combination. Print in Business promises analysis of major businesses forces, from automation to the impact of Brexit. Day four’s sessions are Print in Communication and Print in the Future. Print in Communication will examine the relationship between print and online, and print’s PR problem when it comes to sales and recruitment. Print in the Future gazes forward to exciting developments in fast-evolving areas of print, such as printed electronics, and the next generation of production. 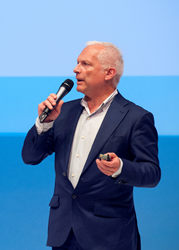 Roland Biemans, responsible for business development at European technical consultancy LMNS, will point to the horizon of technology development and discuss how inkjet is creating opportunities in areas previously unexplored by print. The latest IPEX 2017 conference programme can be found at http://www.ipex.org/programme. The programme will continue to be updated over the next few weeks as further speakers are confirmed. IPEX is the UK’s longest running international print show. The event takes place from 31st October to 3rd November 2017 at the NEC in Birmingham. IPEX 2017 will be a showcase of innovation, technology and print in action, covering a range of applications including printing, software, digital, and finishing. Registration is open and IPEX is free to attend, visitors are advised to register early to avoid the queues and take advantage of travel discounts and event updates. IPEX is part of Informa’s Global Exhibitions Division. With over 200 trade and consumer exhibitions annually, Informa Exhibitions is a global market leader in such end markets as Beauty, Construction & Real Estate, Design, Life Sciences, Maritime, Health & Nutrition, Natural Products, Agriculture and Pop Culture. Through face to face and digital channels, our transaction-oriented exhibitions and trade shows enable communities to engage, experience and do business. In doing so, we bring together people who want to buy and sell, network, do business and gain inspiration. Our industry insight, coupled with our innovative and entrepreneurial approach, provides them with the opportunity to create business advantage and access markets. With a heritage dating back to the 1880s, IPEX is the UK’s only truly international print exhibition, attracting exhibitors and visitors from Europe, the Commonwealth and beyond. Comprising a broad range of equipment, technology and services alongside a diverse feature programme, IPEX 2017 will be a landmark for global print exhibitions. Themed PRINT IN ACTION, visitors will see innovative print output and the technologies that made them, learn how print is adapting to the modern world, and be part of a community that has supported this passionate technology industry for more than 100 years.